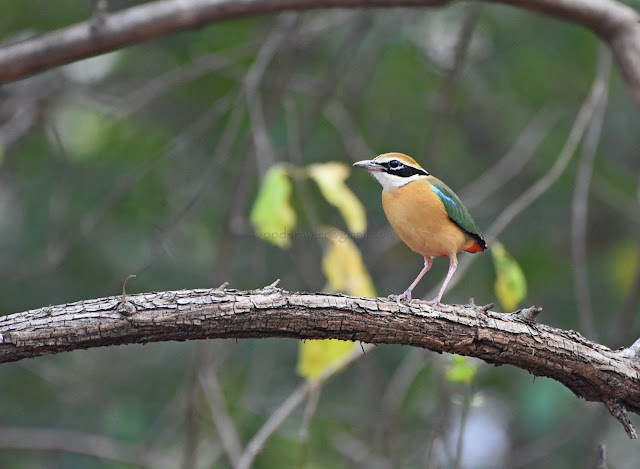 The Indian Pitta (Pitta brachyura) must be one of the most beautiful birds in India, with so many colours packed into a diminutive body (19 cms). It has a stubby tail so it looks like someone cut the tail feathers off! More often heard than seen, as it forages in the dense under bush, I have not encountered many in two decades of woodcrawling! 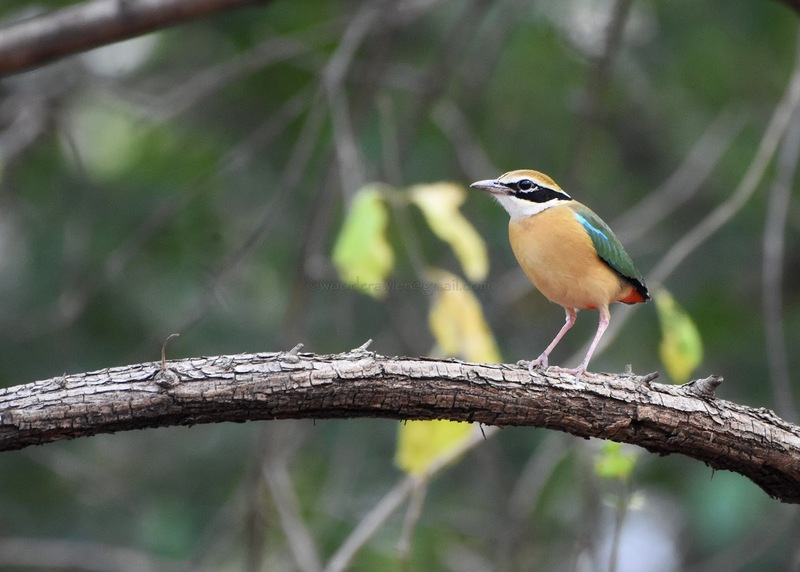 The first time I ran into this diminutive but colourful bird, was in Silent Valley National Park, some 2 decades ago. Those days, I had an film SLR with a lens that was blind in low light. It is a different matter that I wasn't even an amateur photographer then. I am guilty of purchasing a 2x teleconvertor without even knowing if it would match my 70-210 mm lens! 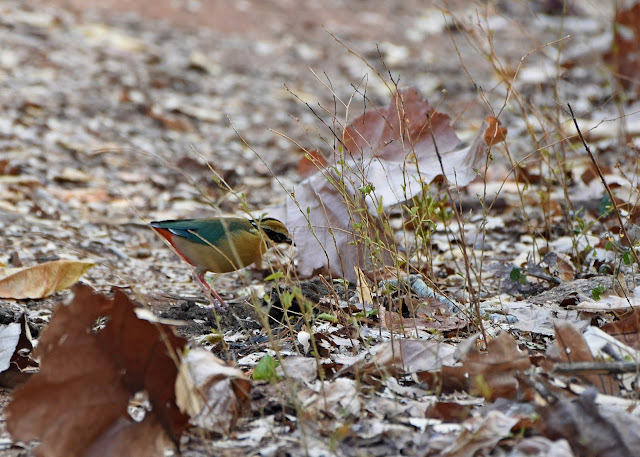 Consequently the photograph I got was a blurred green lump deep inside a bush! 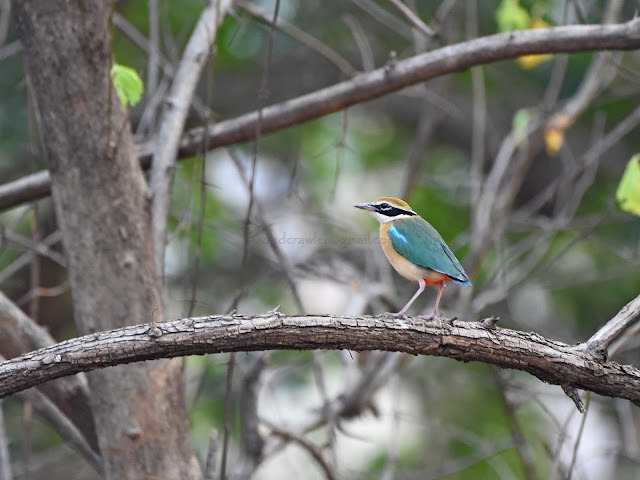 A decade or more later I had a brief glimpse of my second one, in Malampuzha, but the bird disappeared even before I could say "Pitta"! After that, it has been a long gap of hearing them but not seeing one. Then, sometime last year, I had another encounter with this little bird in Bandipur Tiger Reserve. At that time too, the bird was inside a patch of lantana and the noisy safari vehicle only ensured that it disappeared deeper into the undergrowth. So, on Sunday the 5th February 2017 evening, when my son and I were going, to what some of us call the 'nightjar valley', the pitta was the last thing on my mind. As I turned off the main road into the patch of forest I was forced to brake suddenly. 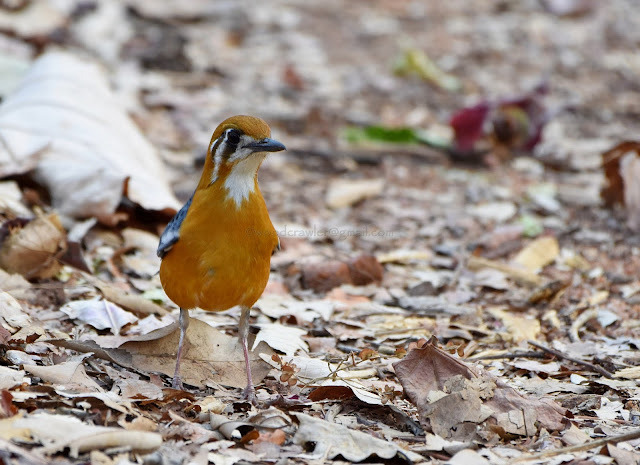 There were three birds on the track ahead, an orange headed thrush right in front, an red-vented bulbul in the middle and another grey-green one further off. 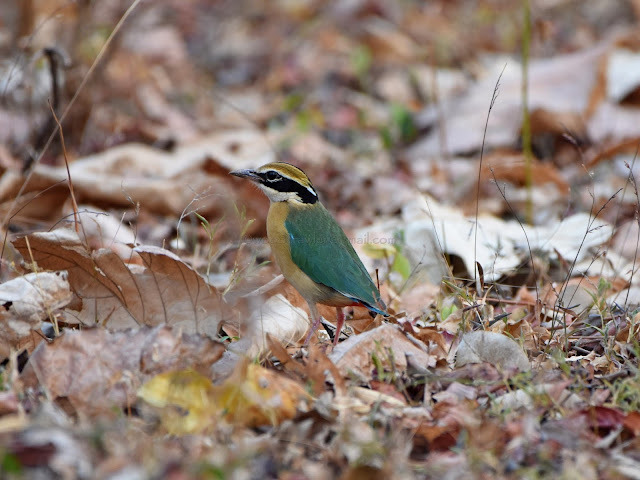 All of them were busy foraging among the fallen leaf litter and seemed to consider my presence an intrusion. 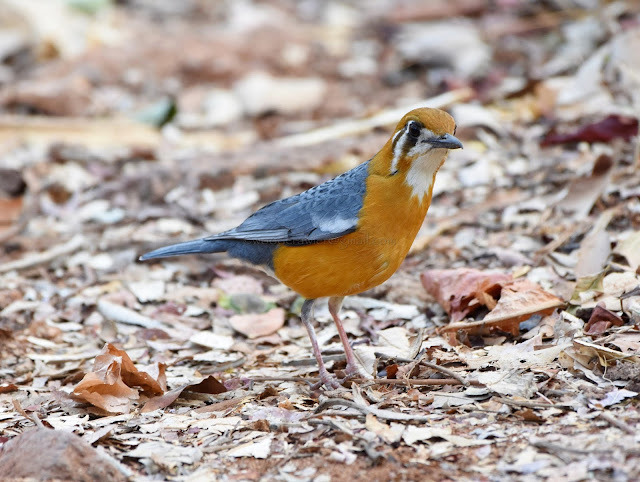 In fact, the orange headed thrush kept coming towards us, without any display of shyness, that it was in danger of being run over!. It was giving us a look that said, "Get out of my way you moron. You are driving over my dinner!" Then it struck me that the third bird, further up the track, wasn't another thrush. The colours weren't matching! As realization dawned, I was felt that familiar tingling that I get when I sight a tiger or a leopard because, to me, the Indian pitta is like a tiger or leopard of the bird world, rarely sighted and photographed. 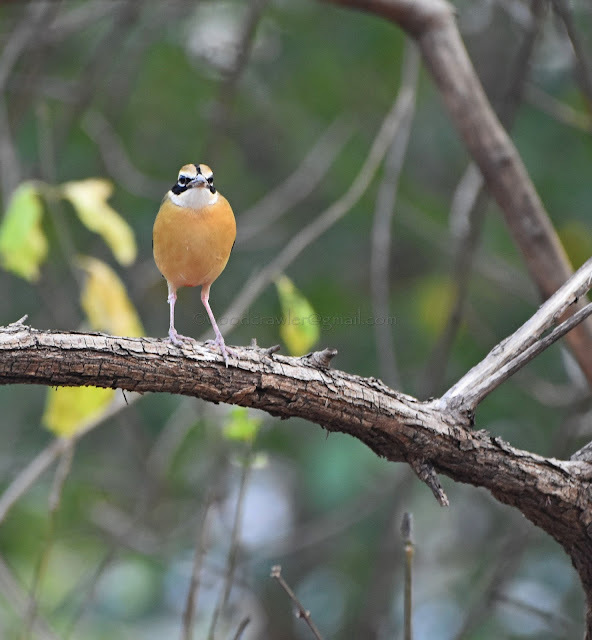 I had one in my sights but I was in an awkward position and in any case too jittery to shoot in failing light! The bird was on my left and my car was facing the other way. I told my son to jump into the back of the car and grab the camera and fire away. 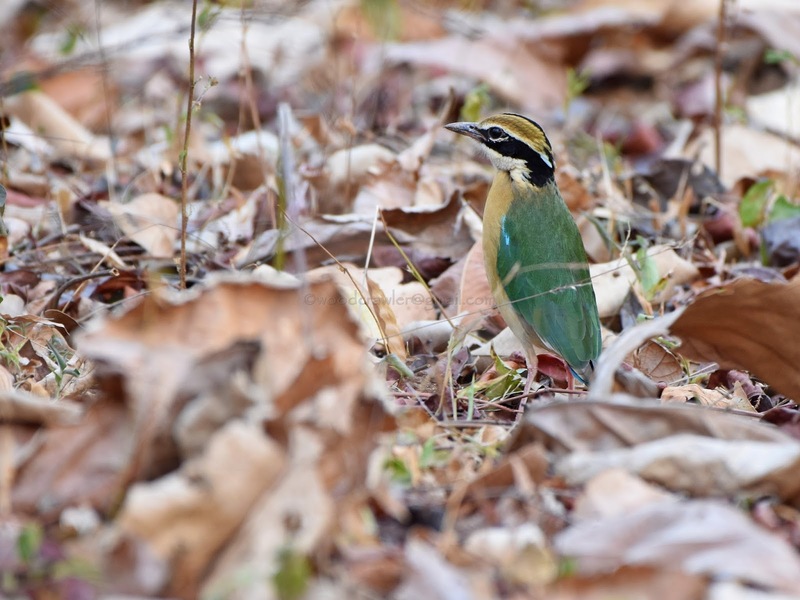 After all it is not every day we run into a pitta willing to wait for us! 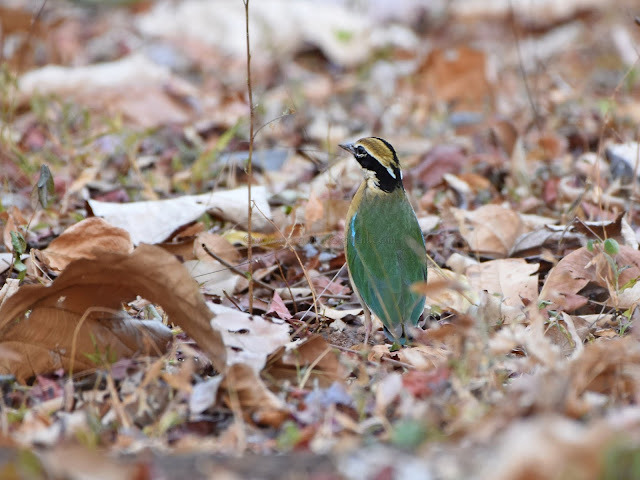 The bird itself was unconcerned by our presence, throwing up the dried leaves and perhaps, searching for some succulent caterpillar or spider under them. Meanwhile, the orange-headed thrush was almost under my car now and I hopped out to see if it was in danger of becoming a roadkill! It was within touching distance before it decided that I wasn't about to budge, and flew off to some other place grumbling about inconsiderate humans! 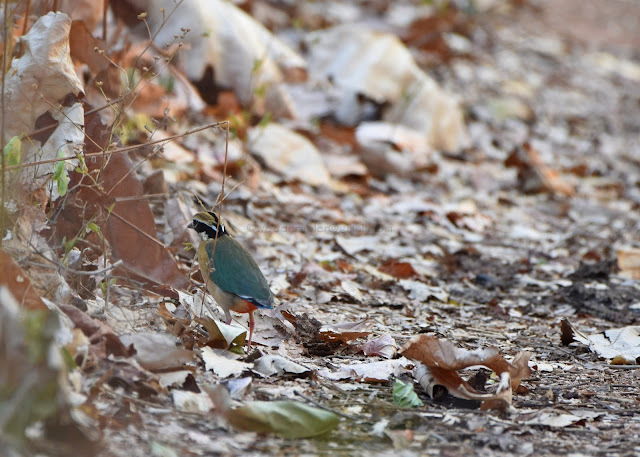 While the thrush had me engaged for a little while, the pitta seemed to have no interest in the proceedings. It was hopping about from one side of the track to the other, as it went forward, lifting up leaves and peering under them. It seemed it wasn't having a good day as we didn't see it catch anything. Since it wasn't appearing disturbed by our presence, I asked my son to walk ahead slowly with me rolling along behind him. 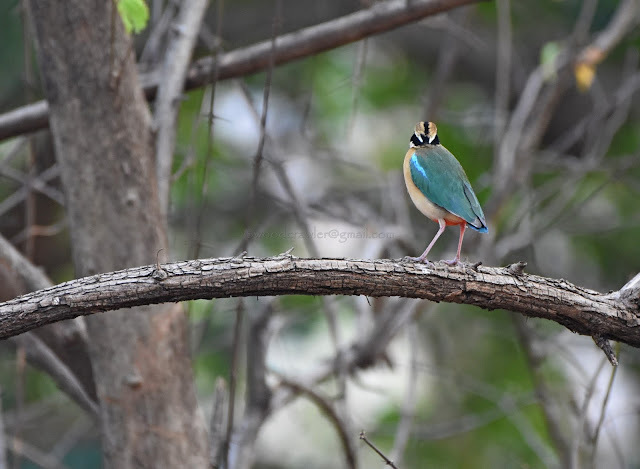 The pitta had reached the end of the track and turned to fly back but realizing that there were some obstruction in its path, it chose to skirt us and land on a tree behind us, instead. Now, the car and I were in the way of my son who had the camera. On the narrow track, he couldn't cross to the bird unless I reversed. I decided that reversing the car would spook the bird so I killed the engine and took the camera. As I stepped out from behind the car, the pitta decided to fly back onto the forest floor again! 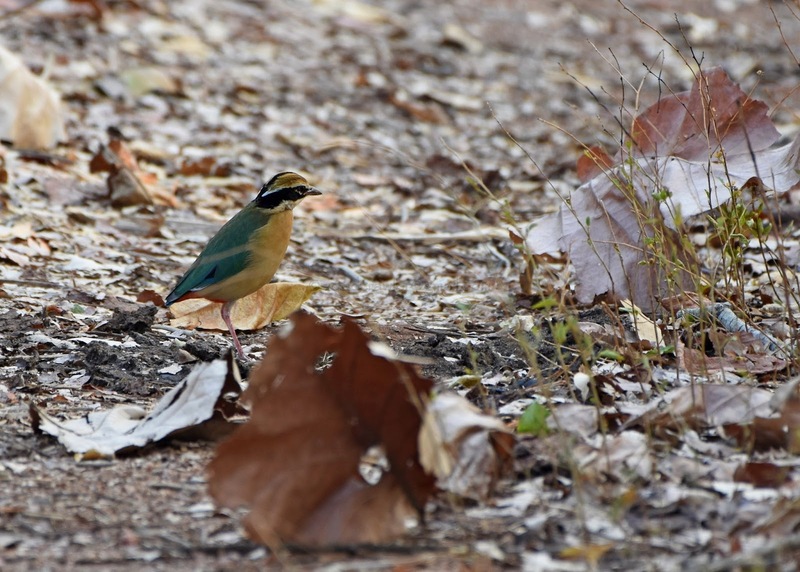 The Indian Pitta is a ground bird, found foraging in leaf litter or in the under bush. 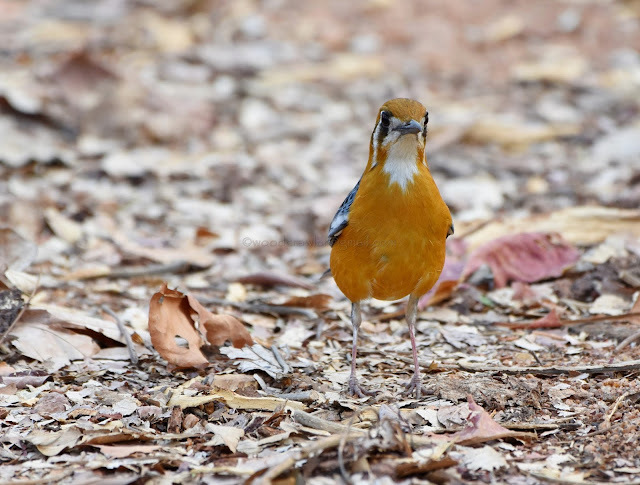 They do roost on trees but make a nest on the ground or lower branches.Their call is a distinctive, two note whistle (whee - tiu) , that sounds like someone is choking the bird! 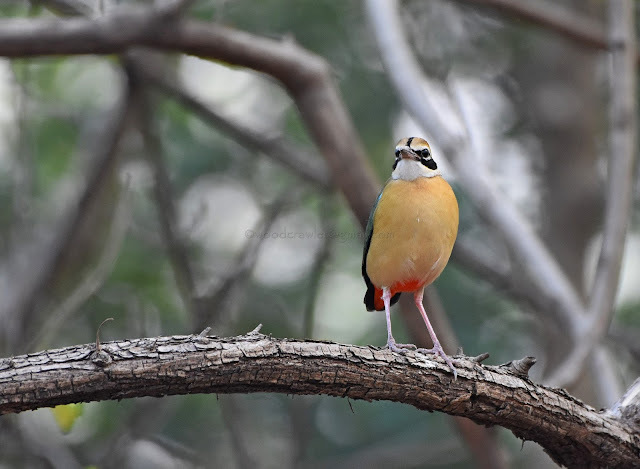 They call at dawn or dusk, and the Tamil name, "aarumani kuruvi" (six o'clock bird) is apt for them. You can listen to the call here on the link from Xeno-Canto. They breed in the north-western Himalayan foothills and central India, but migrate south for winter. They are tiny birds and flying long distances exhausts them and sometimes they end up inside homes or offices! In the meantime, our pitta decided that it was getting too crowded and uncomfortable for foraging, with two-legged creatures and four-wheeled contraptions running around in its territory. Passing motorists had also started stopping to see what I was up to, hopping around among the leaves on the forest floor! 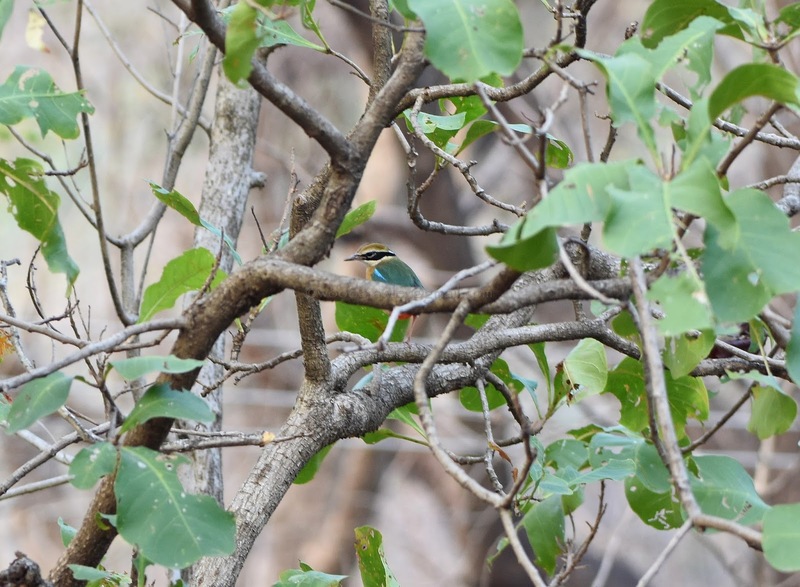 I had no sort of cover and was stepping from tree to tree, trying to hide as much as possible, till I got sufficiently close. Unfortunately, the dried leaves crackling under my feet as I walked wasn't aiding my cause! The bird flew off again but this time, as if taking pity on us, it landed on a thick vine. The perfect perch! I positioned myself as best as I could behind a thin tree, hoping it would hide my bulges! The bird was getting skittish with all the disturbance and I did not want to spoil its dinner any more than I already had. Cranking up the ISO, ( I had no time to dig out my monopod) I clicked as it posed for me, in all possible angles. Profile view, rear view and front view; I couldn't have asked for more. I wouldn't doubt that. 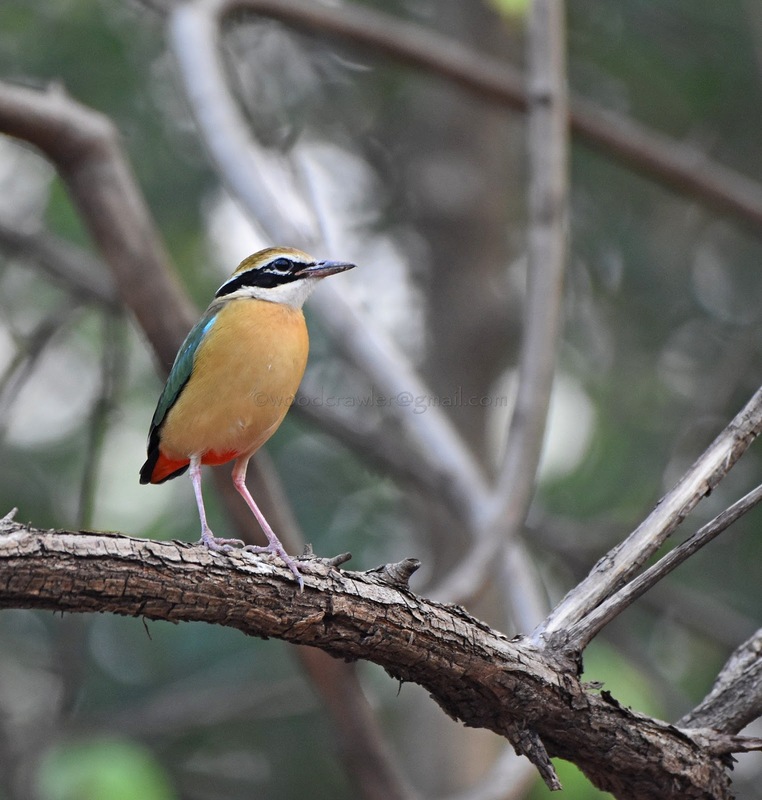 It still is a beautiful bird, one of the prettiest around and perhaps any more colours would have made it too gaudy.